These high-heeled beauties by Giuseppe Zanotti are without a doubt fit for a princess! In this photo, we captured the pale pink of the stiletto heel. Adorned with a sweet flower design on the front of each shoe, these heels made us long for bouquets to match! Shoe choice is always a personal decision for a bride, and some opt for platforms while others choose to walk down the aisle barefoot. Every bride has her own preference, but we love the confidence of women who rock high heels down the aisle. The soft pastel shade of these shoes complemented the stark white of the bride’s gown beautifully. These open-toed beauties also allowed the bride to show off her pedicure! 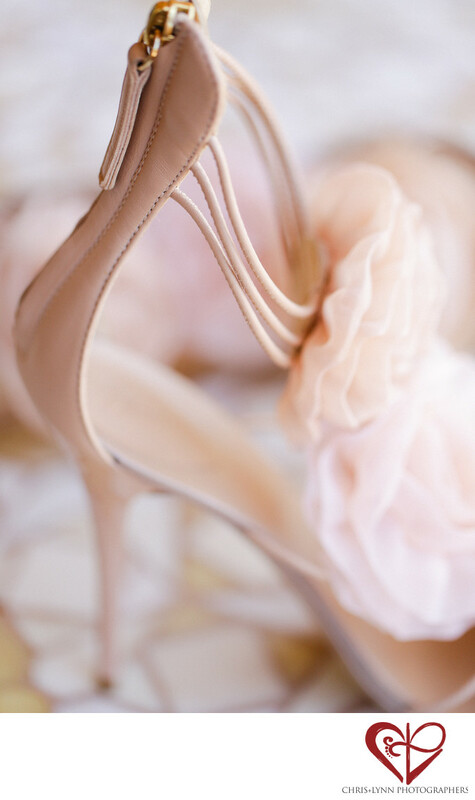 With a macro lens, we’re able to highlight the little details that make a pair of heels like these so special. We love to capture shots of the details that the bride and groom spent so many hours choosing together. Later, the newlyweds will have the chance to reminisce on their special day with photos of every moment to keep their memories vivid and clear. 1/800; f/2.8; ISO 400; 100.0 mm.